I have been working with a few school districts on maximizing their technology's impact, and the issue of student security and privacy often comes up. This blog entry is meant as material for discussion, and my comments or thoughts are not intended to serve as legal advice in any way. This post is simply a way to start the discussion and is an opportunity for all of us to hear various perspectives. How many of you have seen this: A proud parent attend a child's school program, such as a band performance, chorus concert, or play, and he or she takes way too many photos of the event or records every second on videotape. I certainly have! We're proud of our children. We want all their shining moments captured so we can view them again and again, inflict them on unwitting friends and relatives, and use them to embarrass our kids years down the road, right? In all seriousness, we do want to record the events of our children's lives, because those events are precious. The digital age has made this so much easier. Now, not only can we photograph and videotape these performances, but we can also share the recordings with friends and relatives around the world with a few quick clicks of a mouse. We can also archive them in multiple ways, safely securing and storing them for any time we might want to watch and listen again. I've certainly taken full advantage of the many opportunities to record my own child, and to digitally mix and share those recordings. I have them stored on my computer, backed up onto a separate hard drive and, in some cases, shared in online folders. However, I'm careful not to expose private information or put my child in harm's way. Further, I certainly don't include images or videos of other people's children. If other children are a part of the video, I simply don't share it outside my own family. 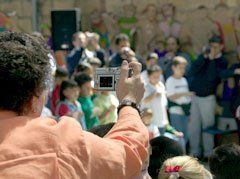 This new technology has made the whole process of videotaping or photographing school events more complicated. What if a parent wants to film the whole concert and post it on YouTube? What does a school say to that? Do other parents know that their child might be visible in this video that will be available to the whole world? Does it matter? Does a school ban videotaping all together just to be safe? A school in Virginia recently found itself in this very situation, and it is finding it difficult to balance the tradition of proud parents wanting to videotape these special moments with the need to protect people's right to privacy from a worldwide Internet audience. Also, if a school choir has permission to sing songs, does that permission extend to someone recording those songs and uploading them to a Web page? That's not likely, depending on the song and its copyright details. Here's how a district I've recently been in contact with has handled it. Charlie Makela, from Arlington Public Schools, in Arlington, Virginia, says, "The copyright issue was an easy one because, usually, the performance rights that accompany most music and plays do have stipulations concerning recording the performance. A careful reading of the license will indicate if recording is allowed. We asked a number of educators what they thought, and most people responded that we should develop a disclaimer and print it on the event's program to indicate that we do not allow the recording of the performance. Some even suggested an announcement at the beginning of the event to remind parents of the law." YouTube, for example, clearly states in its user agreement that uploaders should follow all copyright laws and that users assume all responsibility for posting only legal materials. We can inform parents of the copyright legalities, but can we enforce them? Is it even the school's responsibility? The Arlington schools are working on possible solutions. One idea is to simply educate parents, providing clear reminders about copyright laws and safety, but stopping there and not attempting to monitor parents at all. Another tactic would be to strongly discourage parents from recording events, but not necessarily enforce a ban. A third tack would be to prohibit recording of any kind in order to protect everyone involved. How does your school or district handle this? Has it come up yet? What solution did you reach? Please share your thoughts here.